DESCRIPTION: Nothing is prettier than ruby and diamonds playing together! 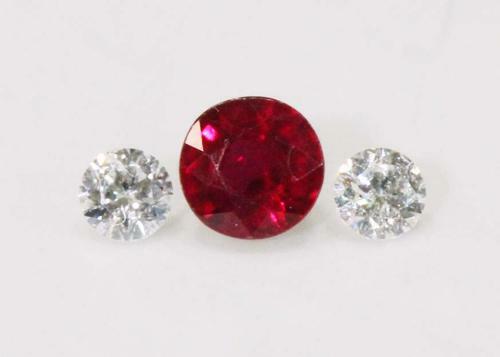 This set contains a pair of 0.07 diamonds and a 4mm faceted round ruby. The pair of diamonds have a clarity grade of SI, with a color grade of E-G. The ruby weighs 0.42 ct. A beautiful set! Shipping, Handling & Insurance: A fixed fee of 18.00 USD will be charged for shipping this item.